Robbie Ferrara in action against Manchester Phoenix. Robbie Ferrara could be forgiven for enjoying being part of a successful Phantoms side more than most. The homegrown defenceman had to win his place in Slava Koulikov’s squad the hard way during last season. Ferrara initially dropped down to play for Peterborough Islanders in the summer of 2014 and spent the first half of last season captaining the city’s second side in National League Division Two South hockey. But a spate of injuries and the exit of an import provided him with the opportunity to stake his claim for a Phantoms return last January . . . and it was a chance he seized with both hands. The 25 year-old impressed enough to clinch a permanent return and helped secure play-off glory before retaining his spot on the roster for the current campaign. Ferrara admitted “It is very satisfying to have earned my place back in the Phantoms squad. “It was mainly a confidence thing that led to me joining Islanders and dropping down a couple of leagues really helped in that regard. “It certainly meant I was able to perform better when coming back into the Phantoms roster. 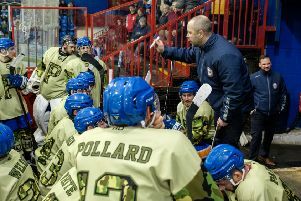 “They had a couple of injuries and gassed their import defenceman so the opportunity arose to come back in. “Slava asked me to play in a midweek game against Bracknell in January. It went well and I was involved again the following weekend before signing full-time. “It was great to help the guys win the play-off trophy and it was always my intention to be back again this season. “We have a young group of ‘D’ guys. Slava puts a lot of pressure on us, but he also shows a lot of faith in us as well. “We have great firepower at the club, but the defensive guys also have to do their bit. “It is good to know we have a great netminder behind us. Nine times out of 10 he has our back if we do happen to make a mistake. Ferrara first broke into senior hockey in the 2006-07 season and was part of the treble-winning Phantoms side of 2008-09. He spent two seasons at Nottingham Lions before returning to the city in 2011-12. Robbie is the middle of three Ferrara brothers. Phantoms captain James is the eldest while youngest sibling Luke is enjoying a first full-time season in the Elite League with Sheffield Steelers.